There is a long-standing debate over the goals of corporations. Should they focus mostly or exclusively on earning profits? Should they be willing to take on broader social missions? Should they be required to do so? What follows are some notes and snippets on this controversy, from various angles. At least among economists, the usual starting point for these discussions is an essay written by Milton Friedman in the New York Times on September 13, 1970, called "A Friedman doctrine -- The Social Responsibility of Business is to Raise its Profits." As with many things written by Friedman, it is a starting point both for those who agree and who disagree, because of the clarity and pungency with which his views are expressed. The essay can be tracked down through the NYT archives and at various places on the web (like here). Insofar as his actions in accord with his "social responsibility" reduce returns to shareholders, he is spending their money. Insofar as his actions raise the price to customers, he is spending the customers' money. Insofar as his actions lower the wages of some of his employes, he is spending their money. Friedman has no objection, as he states later in the essay, if the owner of a business wants to act in accordance with an idea of social responsibility. He recognizes that certain kinds of social expenditures can raise corporate profits--but points out that in such cases, calling for profit-maximization works just as well. Friedman is of course supporting the idea that corporations follow both legal obligations, and also ethical obligations. He is pointing out that if social responsibility has additional costs, someone pays for those costs. A point Friedman does not state explicitly in this essay, but is implicit to many economists, is that the "social value" of a corporation lies partly in the way that it uses know-how and work to organize and combine various resources--workers, physical capital, and knowledge that can range from breakfast recipes to pharmaceutical formulas. By acting in this way, a corporation provides a service that customers believe is worth their money and jobs that workers believe are worth accepting, as well as buying inputs and supplies from other businesses and thus supporting them as well. If a company consistently makes losses and does not earn profits, these benefits will be lost. On the other side, a company that earns profits then has access to finance that could be used to expand in a way that satisfies more customer and hires more workers. It seems to me that many discussions of the "social responsibility" of firms do not pay sufficient attention to these gains from pleasing customers and paying workers and suppliers. Such gains should not be taken for granted. "Friedman recognizes that most people, when they invest, look not only at their financial returns but at other dimensions of their investment. However, he also makes an assumption that social activity and business activity are completely separable. That assumption holds true in the case of donations. If you want to donate a lot of money to your alma mater, you can do it directly through the corporation, or you can distribute the money to shareholders and let the shareholders decide if and how they want to donate it. There is no value destroyed by the donation being made at the shareholder level, and because there is more flexibility in that route—and because I have a different alma mater than many of my fellow shareholders, and we all have different ideas about where our money should go—it is better to push that decision down to the shareholder level rather than doing it at the corporate level. So, if the only social activity we were talking about were corporate donations, Friedman’s principle would be absolutely correct. There are plenty of funds that abstain from investing in certain stocks for reasons unrelated to financial return. Environmentally friendly funds, for instance, don’t invest in oil companies. But while investing in a fund like that might save your soul, it doesn’t save the planet. If everyone who cares about the environment doesn’t invest in a particular company, it will be controlled entirely by people who don’t care about the environment, and they’ll run the company in the most environmentally unfriendly way. If you care about the environment, why not create an environmentally friendly index fund that includes oil companies, and then go to shareholder’s meetings and vote for board members who care about the environment too? Although Zingales is a strong advocate of giving shareholders a bigger voice to express a broader range of corporate goals, he is also suitably pessimistic about how much this might actually end up accomplishing. An accompanying article in the Chicago Booth Review talks about "impact investors" and the "double bottom line" strategy when a company sets explicit goals both for profits and also for other objectives, like level of carbon emitted. The main thing that Friedman is worried about is that we would not want to be in an environment where the CEOs of companies, just because they happen to be the CEOs, are deciding for us as a society, as an electorate, which social objectives we care about and which we don’t. We hope that we have a political process in place where the preferences of the electorate about spending on schools or spending on alleviating homelessness would be expressed through the political system, but I think there is a concern that without some guidance as to what social goals companies should be pursuing, especially when those social goals are no longer fully aligned with long-term valuation, we might give corporations too much power. On the one hand, I recognize the gigantic failure of the political system, and so I would like corporations to do more. On the other hand, it’s a risky business because corporations, as Sue was saying, don’t represent all the people. They represent a subset of people. So, if we give them a huge amount of political power, I’m not so sure that they’ll fix the problems the right way. Here's a random assortment of some other thoughts about corporations and social value that have been piling up in my files. The growth of the liberal market, I would argue, promotes virtue, not vice. Most of the clerisy—themselves, as Bismarck described them with disdain, having “no property, no trade, no industry”—think the opposite: that it erodes virtue. And yet we all take happily what the market gives—polite, accommodating, energetic, enterprising, risk-taking, trustworthy people with property, trade, and industry; not bad people. Sir William Temple attributed the honesty of Dutch merchants in the seventeenth century “not so much [to] . . . a principle of conscience or morality, as from a custom or habit introduced by the necessity of trade among them, which depends as much upon common-honesty, as war does upon discipline.” In the Bulgaria of socialism, the department stores had a policeman on every floor—not to prevent theft but to stop the customers from attacking the arrogant and incompetent staff charged with selling shoddy goods that fell apart instantly. The way a salesperson in an American store greets customers makes the point: “How can I help you?” The phrase startles some foreigners. It is an instance in miniature of the bourgeois virtues. 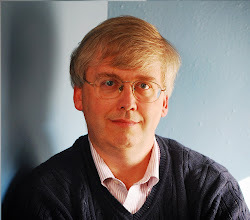 Some years ago, Edmund Phelps suggested that one can make a strong case for capitalism because it has proven to be a better at providing "creative workplaces" than other approaches (from “Interview with Edmund S. Phelps,” by Howard R. Vane and Chris Mulhearn, Journal of Economic Perspectives, Summer 2009). Many will think me naive, but there are few more disillusioned than I am. I don’t believe that good or truth wins out in the end. I don’t believe in the American system of government. I don’t believe in the wisdom of the American people. I don’t believe in religion. I don’t believe in the media. I certainly don’t believe in our education system. I believe in my immediate family, my closest friends, my own ideas. And business. It’s not perfect, but it’s still nothing short of a miracle. I'll add one more observation. When a person lives their life among college students, as I do, it's pretty common to hear talented young adults say with considerable emphasis that they want to work for a non-profit. If the time seems right, I sometimes try to start a conversation about this emphasis. After all, both for-profits and non-profits face budget constraints. Both have reasons to hold down costs and act efficiently, although both may fail to do so. Both need sources of finance, and may need to tap banks or capital markets to get it. The classic argument why some sectors may be non-profit is that for-profits may be tempted to sacrifice quality: for example, we might be suspicious of have privately owned prisons, because we fear that they will not meet a minimum standard of how to treat people. We might be suspicious of for-profit colleges or for-profit hospitals for related reasons. The concern is a fair one. But it's also worth remembering that markets often deliver certain kinds of quality quite well, from food in a supermarket to a smartphone. And some nonprofits may lack incentives to raise their game and improve quality of output, while providing highly paid jobs to some top executives. For those concerned with protecting the environment, or providing food and housing to the poor, or other social responsibility goals, there is always a choice about working within the market system or outside it. One of my friends who has a strong interest in recent immigrants helped created a market for them to sell their handicrafts through a string of stores in several cities. Another one of my strong environmentalist friends worked for giant real estate developers as a hydro-geologist, trying to make sure that such projects would do as little to damage the water table as possible--or maybe even do some good. When it comes to the for-profit/non-profit distinction, and the issues of how to contribute to the many goals embodied in the label of "social responsibility," it seems important to me to dig deeper than quick-twitch reactions of approval and disapproval. About 25-30% of all US workers are in a job that requires an occupational license; for comparison, 10.7% of US wage and salary workers are in a union. The usual justification given for occupational licenses is that they are needed to protect the health and safety of the public. But economists going all the way back to Adam Smith in 1776 (who focused on the issue of how overly long apprenticeships limit labor market competition in Book I, Chapter 10 of the Wealth of Nations) have harbored the suspicion that they also might serve to reduce competition in the labor market and thus help those who have the license achieve higher pay. Occupational licenses are typically granted at the state level, which offers an interesting insight into these issues. 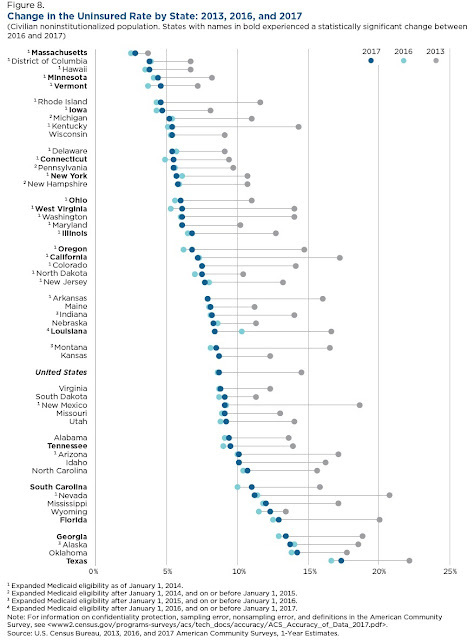 If high quality service is the main reason for occupational licensing, then it should be pretty easy for someone who is qualified in one state to work in another state. If blocking labor market competition is the main reason for occupational licensing, then it will be pretty hard for someone who is qualified in one state to work in another state. In practice, it's often pretty hard to move between states. The Federal Trade Commission examines this issue in "Policy Perspectives: Options to Enhance Occupational License Portability" (September 2018). "It is particularly hard to justify licensing-related barriers to entry when a practitioner qualified and licensed by one state wishes to provide identical services in another state. Because licensing rules are almost always state-based, it can be difficult for a qualified person licensed by one state to become licensed in another state. For some occupations, state licensing standards vary considerably, so applicants licensed in one state may need additional education or training to qualify to practice in another state. Even when a profession’s underlying standards are national and state licensing requirements are similar throughout the United States, the process of obtaining a license in another state is often slow, burdensome, and costly. Indeed, a recent study shows that occupational licensure requirements may substantially limit the interstate mobility of licensed workers, especially for occupations with state-specific licensing requirements. "State-based licensing requirements are particularly burdensome for licensees who provide services in more than one state, and thus need multistate licensing. They are also especially hard on military families, because trailing spouses often follow service members who are required to move across state lines, and therefore must bear the financial and administrative burdens of applying for a license in each new state of residence. The need to obtain a license in another state can sometimes even lead licensees to exit their occupations when they must move to another state. "Multistate licensing requirements can also limit consumers’ access to services. 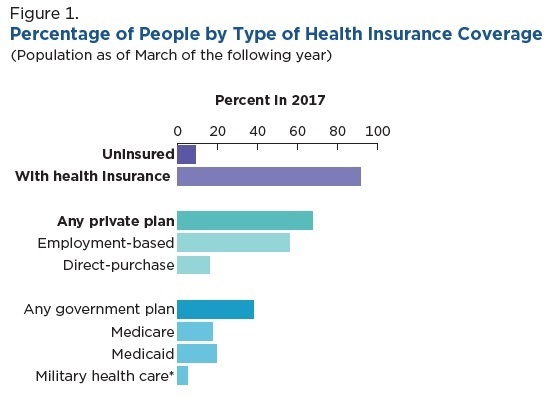 For example, licensure requirements can prevent qualified service providers from addressing time-sensitive emergency situations across a nearby state line or block qualified health care providers from providing telehealth services to consumers in rural and underserved locations." Some professions in some states have addressed this issue. Some states have joined interstate compacts so that those licenses in one state would be able to work i other states in the compact: for example, such agreements exist for nursing, physicians, physical therapists, and others. Another approach is to write a model law or rule for occupational licenses, so that qualifying in one state will be the same as qualifying in another state, an approach followed by accountants, pharmacists, and some others. Related to these options, some states have provisions that allow mutual recognition of certain occupational licenses from the other state, or expedited licenses in one state for those who already have a similar license in another state. But substantial issues remain. The canaries in the mineshaft here are the working spouses of those in the military. About 35% of them work in jobs that require occupational licenses, and they are often shifting between US states every 2-4 years. Teachers, as one common example, often find it hard to shift their licensing between states. The US economy would benefit from greater mobility and fewer workers feeling stuck in place. Postscript: For those who find themselves prone to dismiss anything that smacks of deregulation, especially if it arrives from a Trump/Republican administration, it's perhaps worth noting that the FTC has been studying this issue and expressing concerns going back at least to 1990. Indeed, economists in the Obama administration raised essentially the same concerns about occupational licensing and the importance of portability across state lines. For a flavor of the earlier discussion, see "Occupational Licensing and its Discontents" (August 5, 2015). My focus here is on the notion that if we "don't trade anymore--we win big. It's easy!" If this statement is true, then it seems to me that the Trump administration is wasting our time with wishy-washy economic diplomatic incentives to reduce imports from other countries, like tariffs and talks over trade rules. 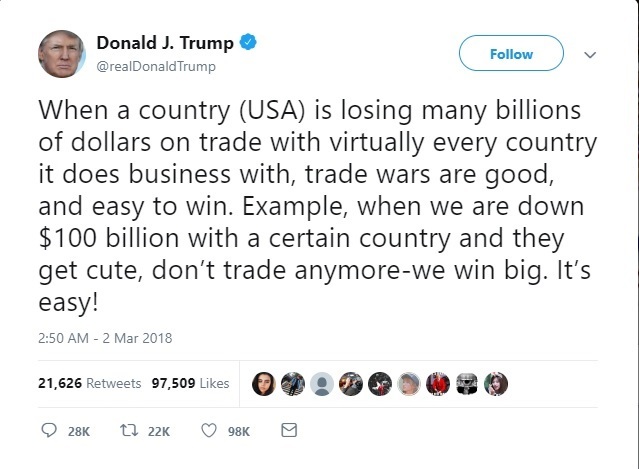 If no trade is a big win, then a serious trade policy sounds like this: Let the US announce that trucks or ships or planes carrying exports from other countries to the US will be destroyed by the US military if they approach US borders. We will extend multiple warnings and give those imports a chance to turn back. But if they do not, then carry through on the threat. After all, the goal is slashing imports. It's easy to win! We win big! One might be concerned, I suppose about retaliation against US exports, or against multinational US companies that are involved in production in other countries. But there is apparently no risk of such retaliation. As Trump's trade adviser Peter Navarro stated back in March: "I don't believe that any country in the world is going to retaliate for the simple reason that we are most lucrative and biggest market in the world ..."
However, it stands to reason that if the US economy wins big from not receiving imported products from other countries, then presumably the economies of those other countries would win big from not receiving US exports, either. If imported products hurt the recipient nation, then a literal military war against trade seems certain to be beneficial for all--rather like many countries coordinating in a public health effort to wipe out a disease that crosses national borders. I suppose the other response is to argue that President Trump and his advisers are only opposed to trade imbalances, and would support balanced trade. But the argument that "no trade beats trade imbalances" doesn't much affect the case for a physical war against trade. After all, the United States could allow imports as long as US exports exceed imports, but then threaten to destroy all imports above that level. I've tried to explain why this view of trade imbalances is benighted (among other places, here and here), and won't go through it again here. But the lack of recognition of gains from trade is quite remarkable. 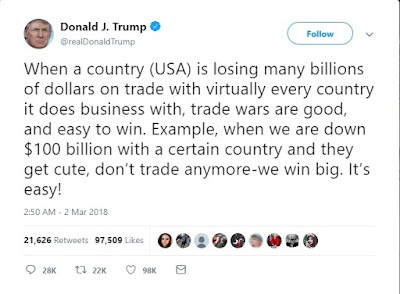 Moreover, when someone takes the positions that 1) no trade at all would be a big win; 2) pretty much all imports should be made in the US regardless of cost; and 3) international trade is a scoreboard where exports are points for the home team and imports are the points for the opposition; and 4) the US should ignore all existing trade agreements like the World Trade Organization in favor of bilateral tariffs--well, it requires greater mental plasticity than I can achieve to believe that their ultimate goal is to increase gains from trade by reducing barriers to movement of goods and services across international borders. In the world of the web, perhaps it is necessary to close by adding that I do not favor a war on trade, either tariff-driven or military. I offer this rumination about a physical war on trade in the hope that it will make the anti-trade agenda look less attractive, rather than more so. Corporate Debt and Leveraged Loans: Financial Snags Ahead? "The past few times unemployment fell to levels as low as those projected over the next year, signs of overheating showed up in financial-sector imbalances rather than in accelerating inflation. 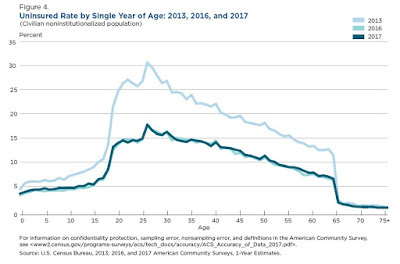 The Federal Reserve's assessment suggests that financial vulnerabilities are building, which might be expected after a long period of economic expansion and very low interest rates. Rising risks are notable in the corporate sector, where low spreads and loosening credit terms are mirrored by rising indebtedness among corporations that could be vulnerable to downgrades in the event of unexpected adverse developments. Leveraged lending is again on the rise; spreads on leveraged loans and the securitized products backed by those loans are low, and the Board's Senior Loan Officer Opinion Survey on Bank Lending Practices suggests that underwriting standards for leveraged loans may be declining to levels not seen since 2005." A few points are worth emphasizing here. As Brainard is pointing out, the last couple of decades suggest that the primary risk of recession in the US economy is not likely to arise from a jolt of inflation. Instead, the last two recessions were associated with financial market stress: the end of the dot-com boom in 2001, and the end of the housing price boom in 2008-2009. Since the Great Recession, a number of steps have been taken to assure that banks are safer and more resilient (higher capital requirements, stress testing, and the like). But the US financial system is a lot bigger than just the banks, and financial troubles can come from a number of directions. What about the two risks that Brainard specifically mentions: corporate debt and leveraged loans? "Now, 12 years later, it’s happening again. This time, however, it’s not households using cheap debt to take cash out of their overvalued homes. Rather, it is giant corporations using cheap debt — and a one-time tax windfall — to take cash from their balance sheets and send it to shareholders in the form of increased dividends and, in particular, stock buybacks. As before, the cash-outs are helping to drive debt — corporate debt — to record levels. As before, they are adding a short-term sugar high to an already booming economy. And once again, they are diverting capital from productive long-term investment to further inflate a financial bubble — this one in corporate stocks and bonds — that, when it bursts, will send the economy into another recession." "[I]f companies in Western Europe and China were to match the appetite of US corporations for bond financing, their markets would double and triple in size, respectively. ... A shift toward bond financing has been observed in all regions. In the United States, bonds accounted for 19 percent of all corporate debt financing in 2000; by 2016, that share had jumped to 34 percent. ... Companies in the United States still lead the world in issuance with $860 billion issued in 2017 ..."
"In the United States, almost 40 percent of all nonfinancial corporate bonds are now rated BBB, just a few steps above noninvestment grade, up from 22 percent in 1990 and 31 percent in 2000, according to Morgan Stanley. Overall, BBB-rated US nonfinancial corporate bonds outstanding total $1.9 trillion—almost twice the size of the high-yield bond market. Issuers are also more heavily indebted than before. The net leverage ratio for BBB issuers rose from 1.7 in 2000 to 2.9 in 2017 ... Noninvestment-grade bonds carry higher default risk, which increases the vulnerability of the corporate bond market.15 In the coming years, a record amount of speculative-grade corporate bonds could need refinancing. In the United States, for instance, the share of maturing bonds that are high yield is expected to grow from 11 percent in 2017 to 27 percent in 2020. The absolute amount—at least $180 billion of high-yield bonds coming due in 2020—will be almost three times the amount in 2017. If current high-yield issuance trends continue, that share will rise even more." "One never knows what the catalyst is going to be for the next financial crisis. ... But the truth is nobody rings a bell at the top of the market and says, `That’s it. It’s over. It’s been fun, guys. It’s all downhill from here.' When I was a banker 27 years ago, the management of United Airlines (UAL) was trying to take it private in what was then one of the largest management buyouts of all time. They had got the commitment letter from Citibank to finance that deal. But suddenly Citibank went back to the management and said, we can’t finance this deal, the market is not there for this buyout. This was in 1991, four years after the stock market crash of 1987. It became a huge problem and shut down the credit markets for the next two or three years. The fact that the UAL buyout could not be financed in the market was the signal that the party was over, and that we were now heading into a severe credit crunch. Anything could be a catalyst. Maybe Tesla trying to go private will be a catalyst for this market shutting down. And that is when real trouble happens. Because people who had nothing to do with it, with the excess, can’t get access to capital." "Bond markets need to enter the digital age. Despite being worth $11.7 trillion, the market is surprisingly antiquated, with little transparency or efficiency. While equities can be traded at the click of a button, buying and selling corporate bonds often requires a phone call to a trading desk at an investment bank, and there is little transparency on the price the buyer is quoted. This method of trading still accounts for more than 80 percent of volume in the United States." Concerns about leveraged loans have been around for a few years now: for example, here are some comments I made back in 2014. The issues here also relate to corporate debt, but in the loan market, rather than the bond market. In the case of leveraged loans, a group of banks get together and make a loan to a company. The banks then package this loan (or a group of similar loans) into financial securities that are then re-sold to investors across all financial markets. Those who remember the experiences of 2008, when mortgages from subprime housing loans were packaged together and sold to investor and financial institutions around the world, will see some worrisome parallels. Again, the financial press has a number of recent articles warning about issues with leveraged loans. For example, here's an article from the Credit Union Times (August 21, 2008) citing estimates that leverage loan market is now at $1.4 trillion, bigger than the market for high-yield bonds. Here's Pearlstein from the Washington Post pointing out the dangers (July 28, 2018). For variety, I'll describe these issues by quoting a few remarks from Robin Wigglesworth in the Financial Times (August 24, 2018). "Specialised investment vehicles known as “collateralised loan obligations” are the biggest buyers of leveraged loans. Issuance of CLOs reached $69bn in the first half of the year, leading S&P to lift its full-year forecast to a record $130bn. But there are a multiplying number of mutual funds and ETFs dedicated to leveraged loans. At the start of 2000 there were only 15 such funds. On the eve of the financial crisis there were less than 90. Today, there are 272 different loan mutual funds, and another eight ETFs that buy loans, according to AllianceBernstein. These have sucked in more than $84bn just since 2010. This looks like an accident waiting to happen. While CLOs have locked-up investor money, mutual funds and ETFs promise investors the ability to redeem whenever they like, despite the underlying loans trading rarely. Even the trade settlement process takes weeks. A loan market downturn could therefore escalate into a severe “liquidity mismatch” between the investment vehicles and their underlying assets, which turns a fire-sale into an inferno." Dealing with financial stresses before they turn into crises is hard to do. But not doing so can have harsh consequences, as I hope we learned 10 years ago in the Great Recession. Aaron Steelman interviews Chad Syverson in Econ Focus (Federal Reserve Bank of Richmond, Second Quarter 2018, pp. 22-27). The interview ranges from broader discussion of slower aggregate productivity growth to comments about productivity in specific industries: health care, car production, ready-made concrete, big box and mom-and-pop retail, major auditing firms, investment choices in Mexico's social security system, and others. Here are a few of the many points that caught my eye. Should we be concerned about artificial intelligence replacing human labor? "We have always found things for people to do. If you go back to the middle of the 19th century, more than 60 percent of the workforce was employed in farming. Now it's about 2 percent. Well, we figured out something for the rest of us to do. So I don't worry about that very much. That said, if I could invent a machine that made everything we consume now and we didn't have to work an hour, I would take that. That's not a bad thing. It does create a distributional issue. Are you going to give all that output to the person or persons who own the machine? I think we could agree that's not a good outcome. So we would have to figure out how to distribute the produc­tivity gains that would arise. But inherently, we shouldn't think of it as a problem." Why are productivity differences rising among firms in the same industry? "An example I talk about in class a lot is when many mainline carriers in the United States tried to copy Southwest and created little carriers offering low-cost service. For instance, United had Ted and Delta had Song. They failed because they copied a few superficial elements of Southwest's operations, but there was a lot of underlying stuff that Southwest did differently that they didn't replicate. I think that presents a more general lesson: You need a lot of pieces working together to get the benefits, and a lot of companies can't manage to do that. It also typically requires you to continue doing what you have been doing while you are changing your capital and people to do things differently. That's hard." Is vertical ownership more about data and management than about actual goods? "[W]e found that most vertical ownership structures are not about transferring the physical good along the production chain. Let's say you are a company that owns a tire factory and a car factory. When you look at instances analogous to that, most of the tires that these companies are making are not going to the parent company's own car factory. They are going to other car factories. In fact, when you look at the median pair, there's no transfer of goods at all. So the obvious question becomes: Why do we observe all this vertical ownership when it's not facilitating the movement of physical goods along a production chain? What we speculated, and then offered some evidence for, was that most of what's moving in these ownership links are not tangible products but intangible inputs, such as customer lists, production techniques, or management skills. "If that story is right, it suggests a reinterpretation of what vertical integration is usually about in a couple of ways. One, physical goods flow upstream to downstream, but it doesn't mean intangibles have to flow in the same direction. Management practices, for instance, could just as easily go from the downstream unit to the upstream unit. "The second thing is that vertical expansions may not be as unique as we have thought. They may not be partic­ularly different from horizontal expansions. Horizontal expansions tend to involve firms starting operations in a related market, either geographically or in terms of the goods produced. We're saying that also applies to vertical expansion. A firm's input supplier is a related business, and the distributor of its product is a related business. So why couldn't firms take their capital and say, well, we think we could provide the input or distribute the product just as well too? So, conceptually, it's the same thing as horizontal expansion. It's just going in a particular direction we call vertical because it's along a production chain. But it's not about the actual object that's moving down the chain. "We were able to look at this issue, by the way, because we had Commodity Flow Survey microdata, which were just amazing. It's a random sample of shipments from a random sample of establishments in the goods-producing and goods-conveying sectors of the U.S. economy. So, if you make a physical object and send it somewhere, you're in the scope of the survey. We get to see, shipment by shipment, what it is, how much it's worth, how much it weighs, and where it's going. And then we can combine that with the ownership information in the census to know which are internal and which are external." 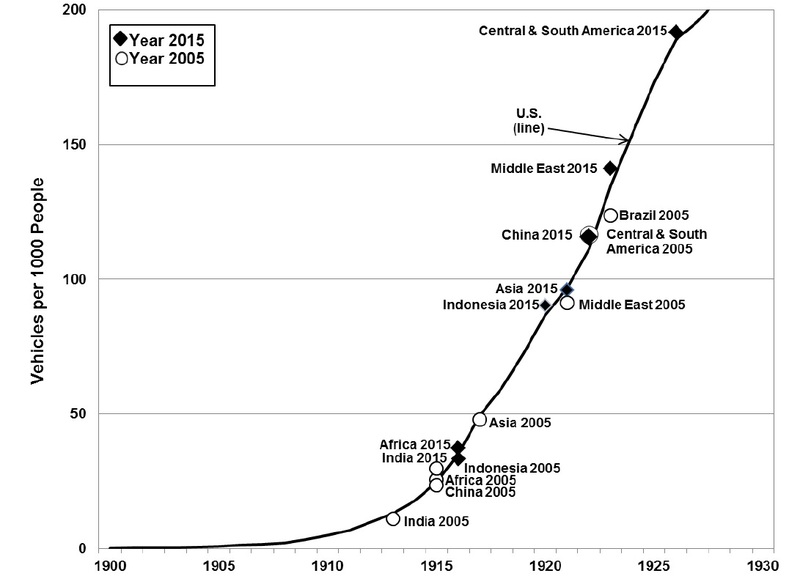 The line in the two panels of this figure shows US motor vehicle ownership per 1,000 people from 1900 to the present. The top panel shows 1927 or so to the present; the bottom panel shows 1900 to 1927. Along the line, for comparison, are various points showing motor vehicle ownership per 1,000 people at other times and place. 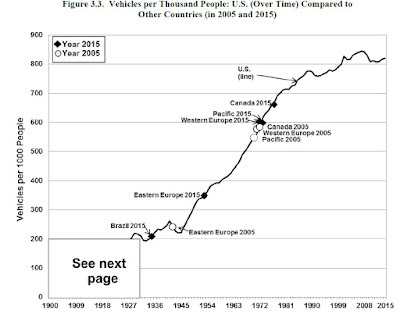 For example, the top point on the line shows Canada's level of motor vehicle ownership in 2015. Down around 200 motor vehicles per 1,000 people you can see the point for Brazil in 2015. The next panel shows what would be in the bottom left corner of the figure above, thus allowing more detail. 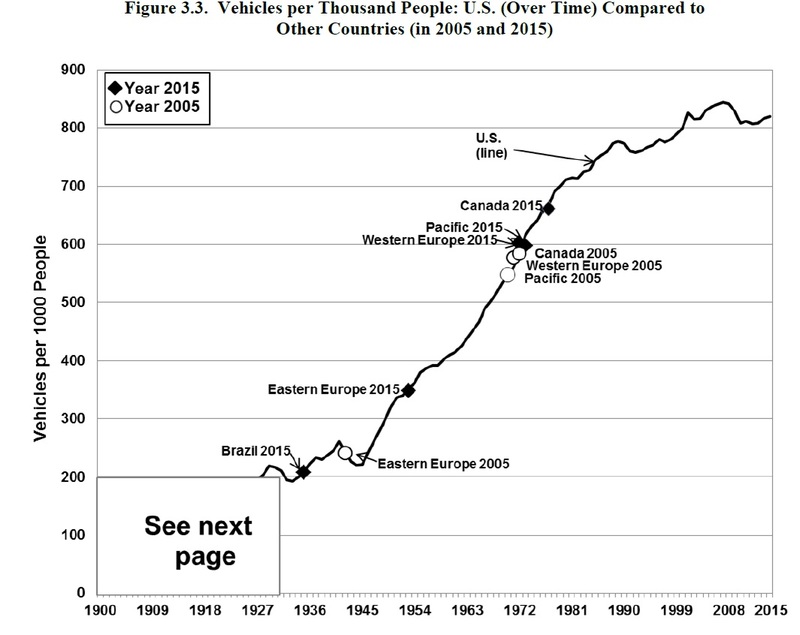 Again, the line shows US motor vehicle ownership from 1900-1927 or so. You can see on the line where motor vehicle ownership is for the Middle Wast, China, Indonesia, countries of Africa, and India in 2015. 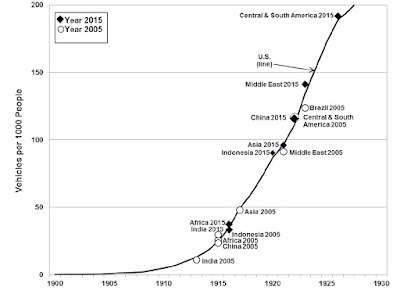 The likely conclusion here is that even if other countries around the world follow an extremely different path of economic development that involves many, many fewer cars--which is not a sure thing--the number of cars in the world is likely to rise dramatically in the next few decades. Unsurprisingly, the large rise in car ownership in emerging markets around the world is already going hand in hand with large rises in car and truck production in those countries. 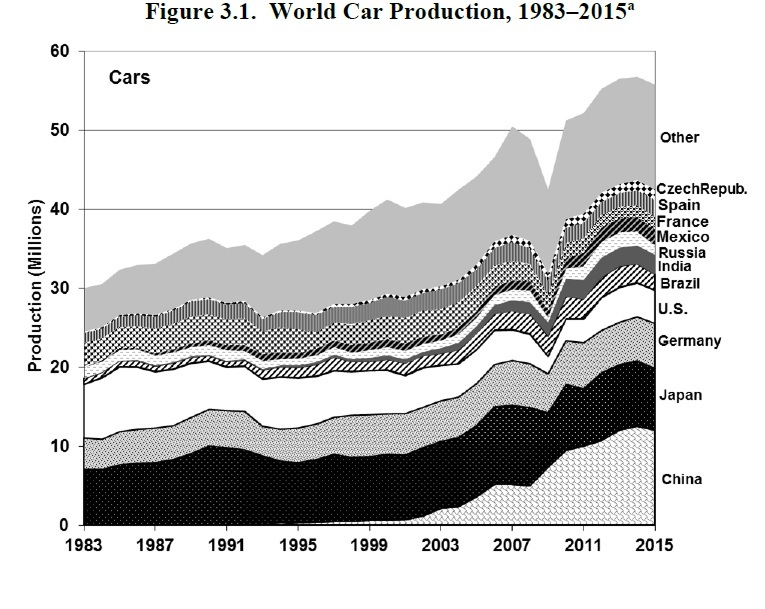 Here's a figure showing the overall rise in car production n the world since 1983. 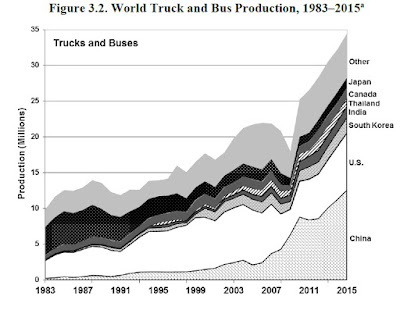 And a figure showing the overall rise in truck and bus production in the world. Just to be clear, light trucks, minivans, and sport-utility vehicles (SUVs) are classified as "trucks." 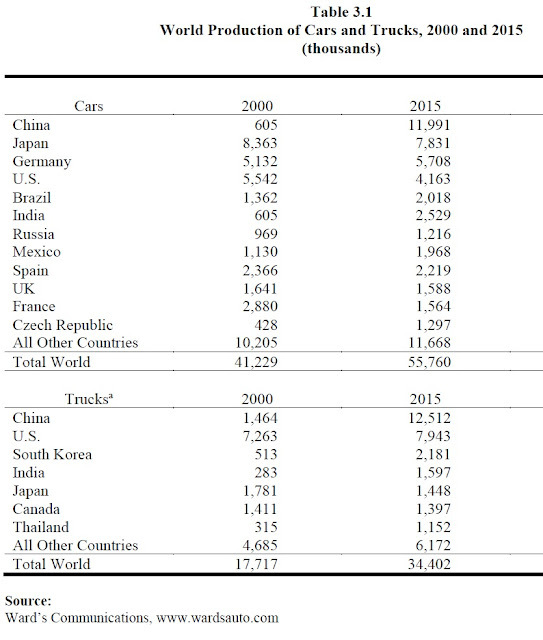 Here is a comparison car and truck production in different countries between 2000 and 2015. 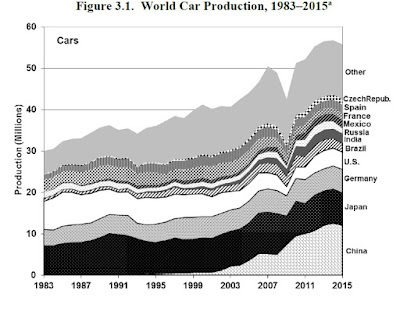 US car production has been dropping and the US now ranks fourth in total car production, well behind the top three of China, Japan, and Germany. However, the US remains strong in truck production--which again includes light trucks, minivans and SUVs. These patterns and trends seem to me interesting for a number of economic and environmental reasons, but let me focus here on some of the trade issues that are so much in the news. The US produced about 7% of the world's cars in 2015, and about 22% of the world's trucks. This is not a dominant market position! I'm of course aware that many of those who are most eager for raising tariffs and other trade barriers claim that they are doing so based on their even deeper support for free and open international trade. (I'm dubious about their expressed motives, but time will tell.) There is a real danger that the tactics of higher trade barriers will lead to US firms being less able to participate in the global supply chains for automobile production. Given that the vast majority of future growth in motor vehicle production will be outside the US economy, this is a concerning possibility. Trivia question for today: What denomination of US currency has the largest number of bills in circulation? Up until 2016, the correct answer was the $1 bill. Now, it's the $100 bill. Here's the evidence from Tim Sablik in "Is Cash Still King?" written for Econ Focus from the Federal Reserve Bank of Richmond (Second Quarter 2018, pp. 18-21). Back in the 1990s and into the first decade of the 2000s, $1 bills were most common, with $20s in second place. (This ranking accurately represents my own wallet, for what it's worth!). 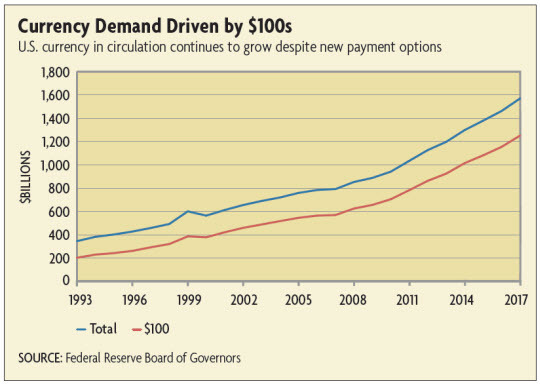 But $100s have growth steadily and taken over first place. 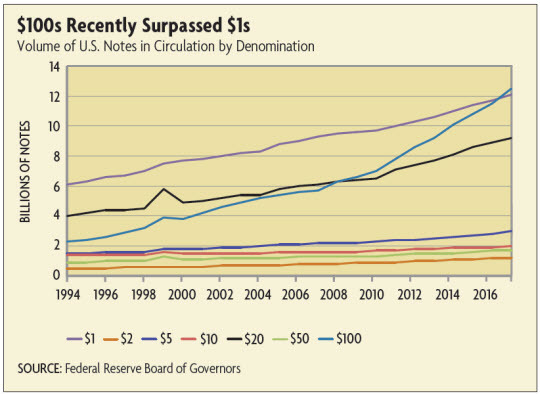 Indeed, the total value of US currency in circulation has been rising over time, but most of that gain in value is due to the rise in $100 bills. The standard explanation is that a considerable amount of US currency is being used outside the US, both as a medium of exchange and as a store of value. Some proportion of that amount--no one really knows how much--is surely helping to facilitate illegal activities. There are ongoing proposals to eliminate large-denomination bills: Sablik points out that the European Union ended production of 500-euro notes in 2016. 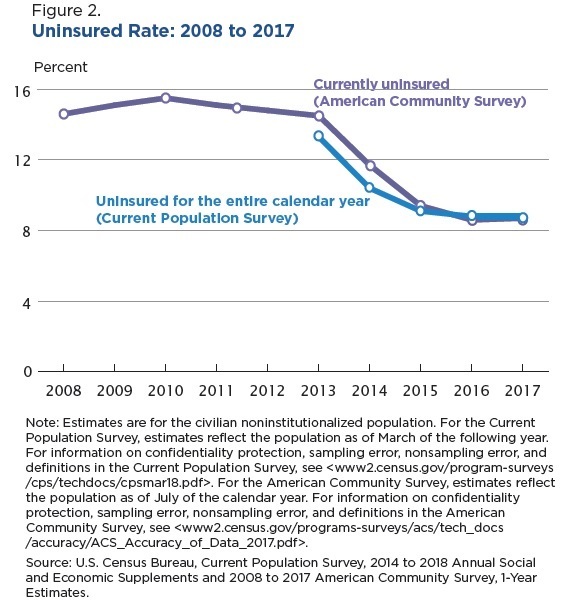 The U.S. Census Bureau has just published its annual report with estimates of the U.S. poverty rate (footnotes and references to figures omitted): " The official poverty rate in 2017 was 12.3 percent, down 0.4 percentage points from 12.7 percent in 2016. This is the third consecutive annual decline in poverty. 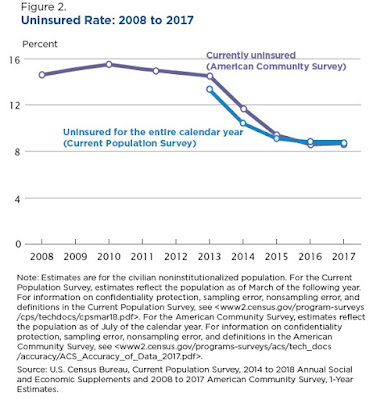 Since 2014, the poverty rate has fallen 2.5 percentage points, from 14.8 percent to 12.3 percent. In 2017, there were 39.7 million people in poverty ..."
English working people everywhere, so far as I know, refuse brown bread; it is usually impossible to buy whole-meal bread in a working-class district. They sometimes give the reason that brown bread is 'dirty'. I suspect the real reason is that in the past brown bread has been confused with black bread, which is traditionally associated with Popery and wooden shoes. (They have plenty of Popery and wooden shoes in Lancashire. A pity they haven't the black bread as well!) But the English palate, especially the working-class palate, now rejects good food almost automatically. The number of people who prefer tinned peas and tinned fish to real peas and real fish must be increasing every year, and plenty of people who could afford real milk in their tea would much sooner have tinned milk--even that dreadful tinned milk which is made of sugar and corn-flour and has UNFIT FOR BABIES on the tin in huge letters. In some districts efforts are now being made to teach the unemployed more about food-values and more about the intelligent spending of money. When you hear of a thing like this you feel yourself torn both ways. I have heard a Communist speaker on the platform grow very angry about it. In London, he said, parties of Society dames now have the cheek to walk into East End houses and give shopping-lessons to the wives of the unemployed. He gave this as an instance of the mentality of the English governing class. First you condemn a family to live on thirty shillings a week, and then you have the damned impertinence to tell them how they are to spend their money. He was quite right--I agree heartily. Yet all the same it is a pity that, merely for the lack of a proper tradition, people should pour muck like tinned milk down their throats and not even know that it is inferior to the product of the cow. In another passage, Orwell discusses how the poor are living by a "fish and chip standard" where cheap luxuries, gambling on lotteries and sports, and electronic pleasures are making life bearable even for those who lack jobs or a realistic chance of economic progress. Trade since the war has had to adjust itself to meet the demands of underpaid, underfed people, with the result that a luxury is nowadays almost always cheaper than a necessity. One pair of plain solid shoes costs as much as two ultra-smart pairs. For the price of one square meal you can get two pounds of cheap sweets. You can't get much meat for threepence, but you can get a lot of fish-and-chips. Milk costs threepence a pint and even 'mild' beer costs fourpence, but aspirins are seven a penny and you can wring forty cups of tea out of a quarter-pound packet. And above all there is gambling, the cheapest of all luxuries. Even people on the verge of starvation can buy a few days' hope ('Something to live for', as they call it) by having a penny on a sweepstake. Organized gambling has now risen almost to the status of a major industry. Consider, for instance, a phenomenon like the Football Pools, with a turnover of about six million pounds a year, almost all of it from the pockets of working-class people. I happened to be in Yorkshire when Hitler re-occupied the Rhineland. Hitler, Locarno, Fascism, and the threat of war aroused hardly a flicker of interest locally, but the decision of the Football Association to stop publishing their fixtures in advance (this was an attempt to quell the Football Pools) flung all Yorkshire into a storm of fury. And then there is the queer spectacle of modern electrical science showering miracles upon people with empty bellies. You may shiver all night for lack of bedclothes, but in the morning you can go to the public library and read the news that has been telegraphed for your benefit from San Francisco and Singapore. Twenty million people are underfed but literally everyone in England has access to a radio. What we have lost in food we have gained in electricity. Whole sections of the working class who have been plundered of all they really need are being compensated, in part, by cheap luxuries which mitigate the surface of life. Do you consider all this desirable? No, I don't. But it may be that the psychological adjustment which the working class are visibly making is the best they could make in the circumstances. They have neither turned revolutionary nor lost their self-respect; merely they have kept their tempers and settled down to make the best of things on a fish-and-chip standard. . . . Of course the post-war development of cheap luxuries has been a very fortunate thing for our rulers. It is quite likely that fish-and-chips, art-silk stockings, tinned salmon, cut-price chocolate (five two-ounce bars for sixpence), the movies, the radio, strong tea, and the Football Pools have between them averted revolution. Therefore we are sometimes told that the whole thing is an astute manoeuvre by the governing class--a sort of 'bread and circuses' business--to hold the unemployed down. What I have seen of our governing class does not convince me that they have that much intelligence. The thing has happened, but by an unconscious process--the quite natural interaction between the manufacturer's need for a market and the need of half-starved people for cheap palliatives. In modern times, we have Americanized the "fish and chips standard" into "burger and fries," but the notion of the poor ameliorating the discomforts of poverty through pop culture and sports, mediated through electronic devices, still has an uncomfortably contemporary ring. For my own part, my life often feels as if I am perpetually experiencing a shortage of time. Somehow, the tasks of life get done. But why can't I do a better job of working especially hard for a few months or a year, and then getting well ahead of my work? Surely, it would be a more relaxed and pleasant life if I didn't live from one deadline to the next?!? But I often fail at saving up time and getting ahead in this way--just as those who are confronted with a shortage of income often fail to try extra-hard to save for a time, to ease what is otherwise an ongoing financial crunch. 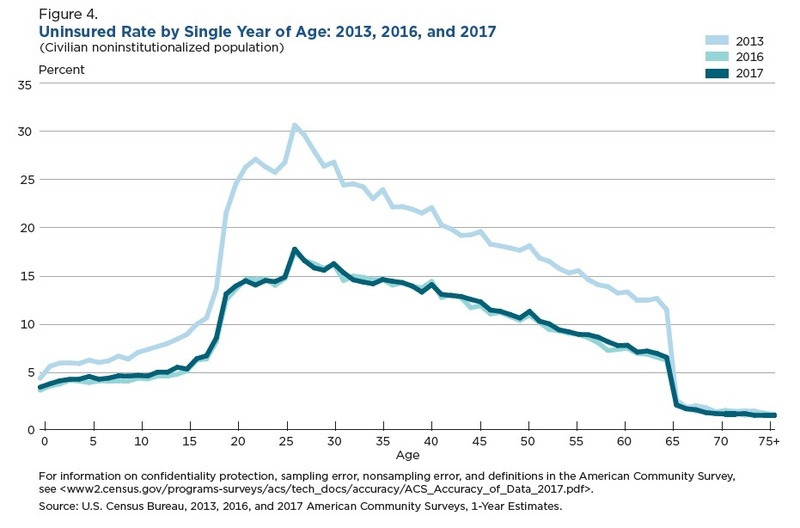 If you compare my own behavior in living deadline to deadline under a shortage of time, and the behavior of a low-income person in living check to check with a shortage of income, some of the patterns look much the same. Sure, there are plenty of counterexamples of low-income people who manage their resources extremely well, under the pressure of limited income. And there are plenty of counterexamples of busy people who manage to work ahead of their deadlines on a consistent basis. But perhaps the central theme of economics is the necessity of making choices as best we can under conditions of scarcity. For many of the modern poor, Orwell's summary of their position in life still rings true. One could look across swathes of modern America and still write: "Whole sections of the working class who have been plundered of all they really need are being compensated, in part, by cheap luxuries which mitigate the surface of life." It is a failure of basic human empathy to blame the poor for behaviors that offer a way of mitigating the surface of difficult life circumstances. 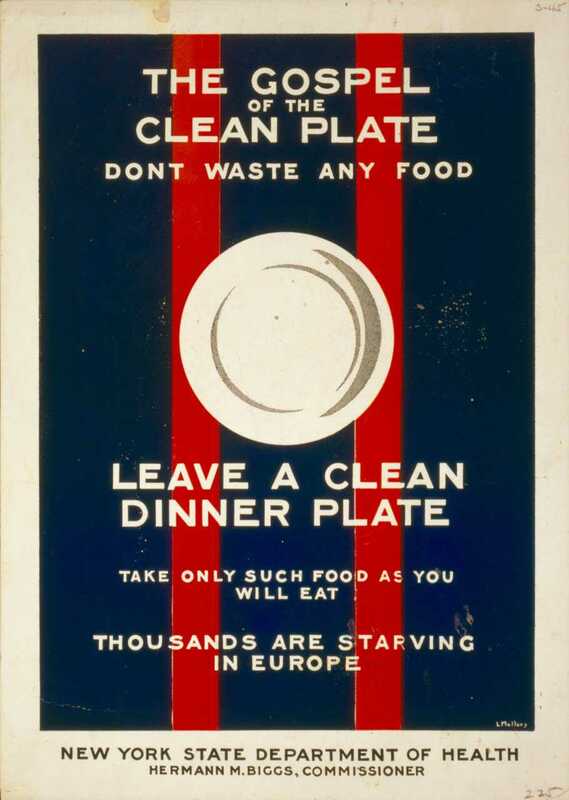 Although that first Clean Plate Club officially ended with World War I, the idea seems to have popped up again over the years, during the Great Depression, during World War II, and at numerous family dinner tables all around the United States ever since. 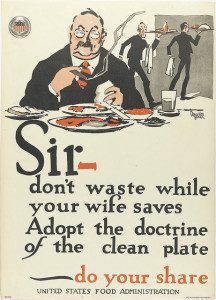 The latest version is courtesy of the National Resources Defense Council and its "Save the Food" project. In radio ads and billboard spots, along with the website, the NDRC often makes a claim: "A 4-person family loses $1500 a year on wasted food." Or as NDRC puts it in a 2017 report: "In 2012, NRDC published a groundbreaking report that revealed that up to 40 percent of food in the United States goes uneaten. That is on average 400 pounds of food per person every year. Not only is that irresponsible—it’s expensive. Growing, processing, transporting, and disposing that uneaten food has an annual estimated cost of $218 billion, costing a household of four an average of $1,800 annually." meals ahead! "Using up leftovers helps the environment." "It’s okay for veggies to wilt and soften. Really. It happens with time and doesn’t mean they’re bad." "Keep herbs like cut flowers – with their stems in a glass of water." "Use a slice of bread to soften up hardened brown sugar." Instead, my strong suspicion--confirmed by a closer reading of the NDRC report--is that the category of household food waste is getting shuffled together with all food waste that happens in every stage of the food industry: in farm fields, storage, processing, wholesale, retail, restaurants, cafeterias, and so on. For another fact-filled website on food waste, see the ReFed web\site: ReFED is a collaboration of over 50 business, nonprofit, foundation, and government leaders committed to reducing food waste in the United States. Two main sets of reasons are given for prioritizing a reduction in food waste. One is the environmental costs of food production and waste disposal.The other is the ongoing presence of hunger in America. Both issues are worthy of concern. But I am unpersuaded that eating softened vegetables, keeping our herbs like cut flowers, and using bread to soften up our hardened brown sugar is much of an answer to either concerns. 1) The environmental protection goal is based on less overall food being consumed. But the feed-the-hungry goal is based on existing food being transferred to those who don't now have it. The goal of less food consumed is different and not aligned with the goal of transferring food to those who need it. 2) Telling households that they are wasting $1500 per year in the food they purchase for home is incorrect, because food saved from farm fields and processing plants and restaurants doesn't help my household budget. 3) Most households would be better off monetarily and health-wise if they ate more at home, rather that grabbing meals and snacks from restaurants. If people end up tossing some dodgy aged vegetables now and again, at least they were trying to eat some food found in nature. Telling people about how money spent on food at home is often wasted is not necessarily an incentive to spend more on food at home! 4) The environmental costs of food production are real. There is a long list of ways to address issues of water use, energy use, fertilizer runoff, land erosion, and other issues. Working to reduce the total quantity of food demanded is not obviously the most effective approach. 5) The problem of hunger and malnourishment in certain US populations is real. But the practical answers aren't about reducing household food waste. Instead, they involve greater buying power for low-income families and assuring an availability of food, together with education to help these families spend food resources more effectively--which will often involve more meals eaten at home and, yes, some additional food thrown away at home. 6) The notion of "waste" can be elusive. There are economic reasons that some amount of food might be left unharvested in a field, or thrown away from a restaurant. An economist is tempted to infer that "waste" really means "not worth the costs of saving it." In the autumn it can be better to buy a large number of fresh apples, even if a few end up going to waste, rather than to risk running out of fruit on a Wednesday night with no time to shop, or not having enough on hand to make an apple crumble. At the end of the day, it's of course hard to oppose reducing waste. But I'm mildly allergic to policy discussions based on a combination of misleading statistics and finger-shaking mini-sermons, like this newest version of the Clean Plate Club. China's Belt and Road Initiative: Grand or Grandiose? China's Belt and Road Initiative was first announced five years ago in 2013. Broadly speaking, the grand plans is for a grand set of transportation connections from China across Asia, and reaching to Africa and Europe. Some of the connections would be overland (the "belt") and others would be overseas (the "belt"). Chinese banks and investment funds would provide substantial finance for these projects, and Chinese firms--many with considerable experience building infrastructure in China-- would carry out a substantial chunk of the work. The timeline for a massive set of infrastructure investments that could affect 80 countries and two-thirds of the world's population is appropriately measured in decades, not in a few years. Still, five years after the main announcement is a reasonable time to review the record. Jonathan Hillman offers one perspective in "China's Belt and Road Is Full of Holes" written as a Policy Brief for the Center for Strategic & International Studies (CSIS, September 2018). For additional detail, the Economist magazine ran a cover story on the subject in the July 26 issue, "China has a vastly ambitious plan to connect the world: What is behind the Belt and Road Initiative?" In evaluating the Belt and Road Initiative, the first step it to recognize that there is no list of what projects included, or not included. As Hillman writes: "The BRI is also breathtakingly ambiguous. There is no official definition for what qualifies as a BRI project. There are Chinese-funded projects in countries not participating in the BRI that share many of the same characteristics. The BRI was officially launched in 2013, but projects started years earlier are often counted. The BRI brand has been extended to fashion shows, art exhibits, marathons, domestic flights, dentistry, and other unrelated activities. The BRI’s loose, ever-expanding nature, and a lack of project transparency, have led many observers to exaggerate its size. When assessing the BRI, there is always a risk of imposing order where, by design, it does not exist." Or as the Economist puts it: "No definitive BRI map has been published. The scheme has expanded far beyond its original core of Eurasia and the Middle East, from New Zealand to the Arctic, Africa to Latin America and even outer space. Estimates of the BRI’s total intended investment range from $1trn to $8trn." There are a number of motivations, all possibly overlapping, for the Belt and Road Initiative. 1) As China becomes the largest economy in the world, it will want to build on trade ties across the region. Many countries in south and east Asia, or on the eastern coast of Africa, have enormous infrastructure needs. One can paint a picture of the BRI as the basis for an "everybody wins" expansion of global trade. 2) China is looking for ways to sustain its high growth rate. Using a combination of Chinese finance that supports employment of China's construction and infrastructure companies is a potential method of doing that. There is some talk that China would also like to build or transfer some of its lower-margin and environmentally dirtier industries to other countries, as well. 3) From a foreign policy point of view, the Belt and Road Initiative can been seen as a way of projecting Chinese power and influence, both over the governments of countries involved in these projects and also by building ports and other infrastructure that could be used by China's military. There are also some potential economic and political dangers here for China. As an example of issues that can arise, consider the project of building a port in Hambatota, Sri Lanka, as described by a New York Times report earlier this summer (July 1, 2018). Sri Lanka already has one large port at its capital city of Colombo. However, Mahinda Rajapaksa--who was president a few years back, thought it would be a good idea to have a second big port at another location of Hambatota, which happens to be not far from where he is from. Various possible sources of finance evaluated the proposal, and turned it down as not commercially viable. But then China financial sources stepped in and loaned a few billion dollars. The Hamabatota port got built, but it goes largely unused. As the Times reported: "The seaport is not the only grand project built with Chinese loans in Hambantota, a sparsely populated area on Sri Lanka's southeastern coast that is still largely overrun by jungle. A cricket stadium with more seats than the population of Hambantota's district capital marks the skyline, as does a large international airport - which in June lost the only daily commercial flight it had left when FlyDubai airline ended the route. A highway that cuts through the district is traversed by elephants and used by farmers to rake out and dry the rice plucked fresh from their paddies." In the 2015 election, China dumped a few million dollars into the re-election campaign for Rajapaksa, who lost anyway. The debt payments owed by Sri Lanka for this dysfunctional project were climbing. The government of Sri Lanka ended up handing over Hambatota port, and 15,000 acres around it, to Chinese financial interests, in exchange for knocking $1 billion off its debt. But according to the Times story, the Sri Lankan Finance ministry estimates that "[t]his year, the Government is expected to generate $14.8 billion in revenue, but its scheduled debt repayments, to an array of lenders around the world, come to $12.3 billion." Does this kind of experience count as a "success" for the Belt and Road Initiative. China now has ownership and control over a port only a few hundred miles from India--although the current arrangement (subject to later negotiation, of course) is that it will not be used by the Chinese military. On the other side, this kind of "success" comes at a high cost. The funds loaned to Sri Lanka are mostly lost--it's just a matter of when the renegotiation happens. Other countries around the region have become quite concerned about going into debt to Chinese sources of finance, and concerned about whether China will end up meddling in their elections or perhaps bribing their local officials, and concerned about how their domestic workers don't get many of the construction contracts, and concerned about possible environmental damage. In the Belt and Road Initiative, China's banks and investment funds have often been willing to lend to projects that had been turned down by others potential funding sources like development banks, Japan, Europe, the US, and issuing bonds in global financial markets. The Chinese loans have also often included lots of conditions about business going to Chinese firms, but not many conditions about the environment, local workers, or anything else. The bankers and sources of finance in high-income countries will testify that when you loan lots of money to a foreign government which can't repay, that government doesn't feel appreciative! Instead, that government is likely to regard you as an enemy. And sovereign governments can make life hard on foreign investors within their borders, if they wish to do so. The Belt and Road Initiative is a spectacular success as a brand name. But on the ground, matters are less clear. For example, Hillman carries out an exercise of looking at six geographic "corridors" that have been identified with the Belt and Road Initiative, and then asks whether most of the BRI projects are actually happening in those corridors. He writes: "For five of the six corridors, there appears to be no significant relationship between corridor participation and project activity ..." The exception is the China-Pakistan corridor, which is also the only corridor which connects China with a single country. Again, the Belt and Road Initiative will unfold over time, and it's far too early for lasting judgments. But in these projects, China's conduct as a business and foreign policy partner is being judged by other nations across the region--and often found wanting. The World Health Organization reports: "About 5.4 million snake bites occur each year, resulting in 1.8 to 2.7 million cases of envenomings (poisoning from snake bites).There are between 81 410 and 137 880 deaths and around three times as many amputations and other permanent disabilities each year. ... Bites by venomous snakes can cause acute medical emergencies involving severe paralysis that may prevent breathing, cause bleeding disorders that can lead to fatal haemorrhage, cause irreversible kidney failure and severe local tissue destruction that can cause permanent disability and limb amputation. ... In contrast to many other serious health conditions, a highly effective treatment exists. Most deaths and serious consequences from snake bites are entirely preventable by making safe and effective antivenoms more widely available and accessible. High quality snake antivenoms are the only effective treatment to prevent or reverse most of the venomous effects of snake bites." Many of those who die for lack of antivenom treatments are among the poorest people in the world: about half are in India, and another third in countries of Africa. The antivenom needs to be available quickly, which means nearby, which means facilities for storage. For the private sector, there isn't a lot of profit potential in researching and manufacturing antivenom, nor for distributing it around the world to appropriate storage facilities. Those who worry about international public health have traditionally focused on diseases, and snakebite isn't a disease. But in the last year or two, snakebite antivenom has gotten more attention. Organizations like Médecins Sans Frontières have been raising the issue for years. In a meeting in May, the "World Health Assembly in Geneva [the decision-making body for the World Health Organization] demanded action" and passed a resolution. So there's that. But a number of obstacles remain. "Meanwhile, new approaches to make antivenom production simpler and cheaper are being developed. Currently, anti-venom production is laborious. Venom is extracted from a snake, then administered to a horse or a sheep in small doses to evoke an immune response. The animal’s blood is then drawn and purified to obtain antibodies that act against venoms. One promising approach that would make antivenom production quicker and cheaper is recombinant antivenoms. These antivenoms are produced by expressing therapeutic monoclonal antibodies, which can bind to a specific protein or a toxin in snake venom, in an engineered cell line." Different snakes have different venoms, and thus require different antivenoms. Ideally, there would be a universal antivenom, but researchers say this seems a decade away. There seems to be a race-to-the-bottom phenomenon in this market. Potential producers of antivenoms in high-income countries face high research costs. In the areas where snakebite occurs, doses of high-quality antivenom are quite expensive relative to people's incomes, and sometimes several doses are needed. Thus, it becomes common to give patients less than a full dose, and hope for the best. The health care providers who administer the venom often lack training. It becomes common for low-quality medications to enter the market, which in these countries is largely unregulated. In fact, most antivenom products available in these countries have almost never been through a standard clinical trial, looking at effectiveness and possible side-effects. Potential producers for high quality antivenom have been withdrawing from the market. And the market itself isn't all that big: "Added into all this is the issue that the antivenom market simply isn’t that lucrative for big pharma. Market research firm Transparency Market Research put the global antivenom market at $1.7 billion (£1.3 billion) in 2016. Sanofi Pasteur halted production of its FAV-Afrique antivenom, effective for several African snakes, in 2010. Sanofi cited cut-price competition for the withdrawal." There has been a string of articles over the last few years expressing concerns that supplies of antivenom are about to run out. It seems as if some institution-building is needed here if the supply of antivenoms is going to rise to meet the scale of the problem. Here's an overview from a few years ago of the state of the research pipeline for snake antivenom. Here's a more recent overview from the World Health Organization on guidelines for production, control, and regulation of snake antivenoms.